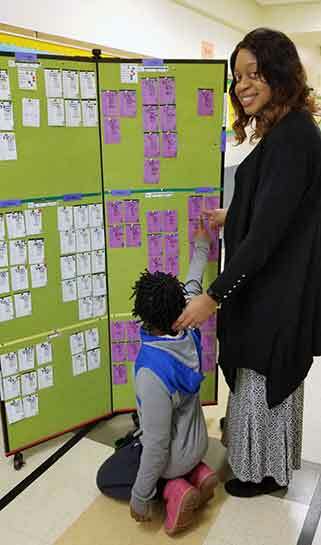 Uses: Education Colors: Green Lengths: DT 3 Panel Display Tower Heights: 6'-0"
Assistant principal Mrs. Fatima Johnson-Avery, and a 5th-grade student look onto the new Math Data Tower. Each panel represents the iReady math data for 6th-grade levels: kindergarten – 5th grades. Each panel is divided into 3 sections by colored tape (green, yellow, and red): On grade level, 1 grade below, and 2 or more grade levels below. Each student has a data card. Teachers record students’ test results on his/her card and move the card on the panel based upon the student’s test results. “I’m very happy with our data tower. It arrived fully assembled. I move it throughout the building for meetings and into the classrooms. Students and teachers love it. Everyone can quickly see where students are and where they need to be by the end of the year,” remarks the Math teacher.